I love children’s books, and now that I have a child of my own, I have an even better excuse to pick them up at every chance! I sometimes shy away from “Bible” story books, only because I have several storybook Bibles for my daughter and I was raised with plenty of Sunday school experiences to show me how cheesy these books can be. 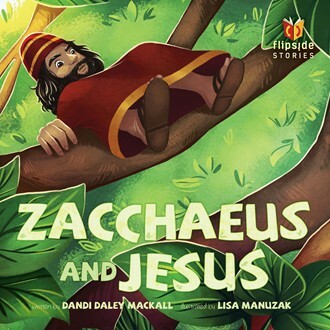 But when I received Zacchaeus and Jesus by Dandi Daley Mackall and illustrated by Lisa Manuzak, I had a feeling it would be different. The story is the age-old, familiar tale of Zacchaeus climbing the sycamore tree to see Jesus. But, it’s told with a bit of a twist to capture my little one’s attention. Read from the front to back, it is the tale told from Zacchaeus’ perspective, but from back to front it is told from Jesus’ perspective. I love this device to teach my child not only a Biblical story, but also to help her understand perspective, point of view, and perhaps how we see ourselves vs. how Jesus sees us. To help her learn more than just a story. This book has large, colorful pictures and just enough text to tell the story without taking too long to flip the pages (very important for an impatient little one!). I would recommend this book to Christian moms and dads thanks to its new and innovative storytelling technique! I received a complimentary copy of Zacchaeus and Jesus from Tyndale House Publishers, but I was not otherwise compensated for this review. All writing, thoughts, and opinions are solely mine. This post contains some affiliate links, which means I receive a small percentage if you make a purchase using this link.